The Early Childhood Montessori Environment is a wonderful place. Children spend their morning choosing from a wide range of enticing and perfectly designed, auto-didactic learning materials. In the Early Childhood environment the curriculum areas are: Maths, Language Arts and Culture. 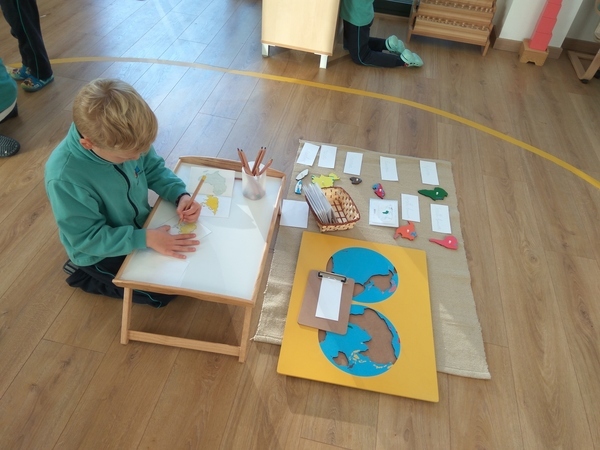 The Culture area includes: Sensorial, Practical Life Skills, Geography, History, Science, The Arts (including visual Art, Music, Drama and Dance) and the development of Movement. There are 12 students for each Montessori Guide in The Children's House. The classroom language is English. 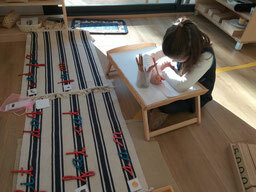 Learning Mathematics is a joy with Montessori materials. 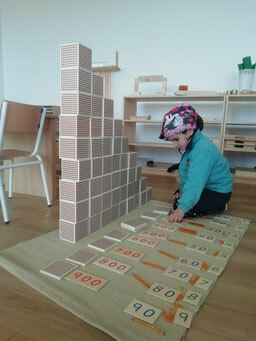 Investigation, classification, orientation, order, reasoning, calculating and measuring are human tendencies and mathematical concepts make perfect sense when manipulating our concrete Montessori materials. Children fully understand each concept before moving onto the next in our individualised learning environment. 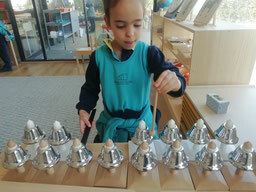 Montessori children are confident and enthusiastic mathematicians. Our Montessori language programme builds self confidence and encourages children to use language creatively. Children learn how to read and write phonetically with ease. Our guides observe each child to determine when they reach their sensitive period in language and are ready to learn to read and write: this could be at 3,4,5 or 6 years old. Bilingual children learn how to read and write in English first: late starters in Spanish. Children enjoy a wide variety of factual, fiction and reference books. Younger children are encouraged to read by observing the older children do so. 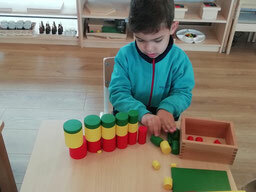 Montessori sensorial materials form a solid foundation of skills relating to observation, perception, ordering, exploration, questioning and speculating. These skills are invaluable later in the school subject areas such as maths, science, langage. The materials refine the senses so that our students learn to observe the world with a scientific eye and an artist's appreciation. Art activities are always available alongside the practical life shelves. Our focus in art education is for our students to learn how to manipulate form, colour, texture and shape through a wide variety of materials encouraging genuine creative expression. Dance and music form part of our daily routine: dance comes naturally and spontaneously to most children and the focus on specific movements develops whole body awareness. Music education includes singing, music literacy, rhythm and playing simple instruments. Practical Life activities are at the heart of the development of autonomy, self-control, self-discipline and are extremely appealing to little hands. Activities include; pouring, washing, sewing, using tools, serving food, laying tables, buttons, zips and clips, sweeping and cleaning windows, and walking, carrying and moving with care . The activities change constantly, making this area a never-ending source of curiosity for our students. Personal and health development includes social and emotional education through discussions about friendship, respect and resolving conflict, alongside Montessori grace and courtesy presentations, and self-care. Children eat healthily and help to grow and care for plants and food in our vegetable garden. Children from 3-6 years old have a special interest in observing natural and social phenomena. In Geography our students become aware of their place in the cosmos, are introduced to ideas about ecology and explore physical, political and cultural geography. At this stage the study of History involves building impressions of time passing and ages past. 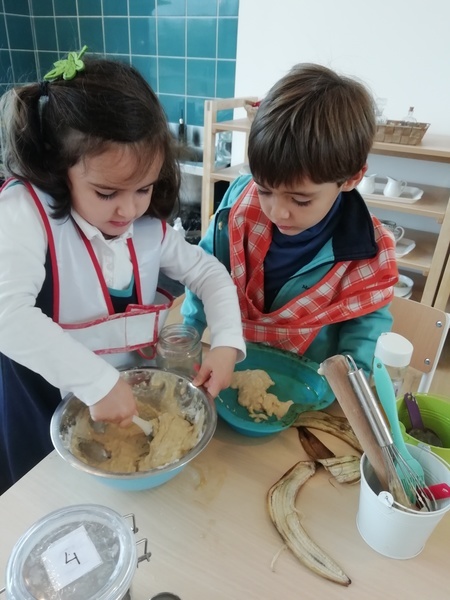 Our termly Continents projects inmerse the children in the culture, cuisine,geography and history continent by continent. Simple experiments introduce Physical science, and children explore the world of plants and animals in botany and zoology.